The Excellence of Falsehood: Romance, Realism, and Women’s Contribution to the Novel. Lexington: University Press of Kentucky, 1991. “The Odyssey: the Iliad’s Wife.” Women in Literature: Reading Through the Lens of Gender. Ed. Jerilyn Fisher and Ellen S. Silber. Westport, CT: Greenwood Press, 2003. 218-21. “Pooh in America: In which the Bear goes on a long explore and becomes altogether different.” Children’s Fantasy Fiction: Debates for the Twenty-First Century. Ed. Nickianne Moody and Clare Horrocks. Liverpool: The Association for Research in Popular Fictions and Liverpool John Moores University, 2005. 349-61. “David Henry Hwang,” The Literary Encyclopedia (www.litencyc.com), 2011. Updated July 2015. Essays on novels of Charlotte Lennox. Dictionary of British Literary Characters, vol. 1. Facts on File, 1992. "Miyazaki's Little Mermaid: A Goldfish Out of Water." Journal of Film and Video, Fall 2014. “Escape From Wonderland: Disney and the Female Imagination.” Marvels & Tales: Journal of Fairy Tale Studies 18.1 (2004): 53-67. Reprinted in McGraw-Hill Reader, 2014. “A Midsummer Night’s Dream: ‘Very Tragical Mirth.’” Q/W/E/R/T/Y: Arts, Littératures & Civilisations du Monde Anglophone 12 (Oct. 2002): 21-23. “Home by Tea-Time: Fear of Imagination in Disney’s Alice in Wonderland.” Classics in Film and Fiction. Film/Fiction 5 (2000): 207-227. “Mirror, Mirror: The Didactic Dilemma of the Female Quixote.” Studies in English Literature 27.3 (Summer 1987): 455-74. Forthcoming: "Welcome Back, Richard, to the Crown and Anchor." Dammit, I Love You (An Anthology). Brand Street Press, Fall 2015. "Tautology." Open Minds Quarterly, Fall 2015. "Frommer's Historical Guide to Upstate New York." Lost Orchard anthology. SUNY Press, 2014. "Phillis's Foul Linen: Sexual Disgust at the Turn of the Eighteenth Century." Interdisciplinary Conference on Disgust, Canterbury, U.K. May 29, 2015. Dr. Ross’s scholarship primarily concerns gender issues in both literary and pop culture narratives, especially Disney and Miyazaki. 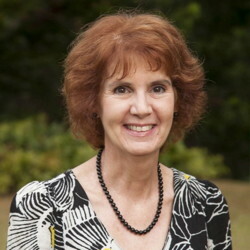 She has also published creative work in CT Review, Hawai‘i Pacific Review, and several on-line magazines.